It’s rare for violin soloists to drastically rethink their approach to a composer, leaving behind two contrasting recordings of the same music. But that’s exactly what happened over the course of 15 years with Viktoria Mullova’s interpretation of J.S. Bach’s Six Solo Sonatas and Partitas for Violin. Following the release of a spectacular 1994 Philips recording featuring a modern interpretation, Mullova re-recorded solo Bach in 2009 on the Onyx label, this time with a Walter Barbiero Baroque bow, gut strings (rather than modern metal strings) and a tuning note lowered from the standard A 440 Hz to the A 415 Hz of Bach’s time. She played a 1750 G.B. 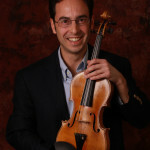 Guadagnini violin. You can read about Mullova’s gradual evolution to Baroque performance practice here. Listen to excerpts of the modern 1994 recording here and then compare it with a sample from the equally great 2009 recording below. Qualities which set this performance apart are the consistent sense of Baroque dance, the distinct drama and tone colors of each variation, and the natural way one variation unfolds into the next. For another sample from Mullova’s 2009 recording, listen to the Fuga from Sonata No. 2 in A Minor. Here is a a live 2013 performance of Bach’s A Minor Violin Concerto. Born in Russia, Viktoria Mullova was a student of Leonid Kogan. She won first prize at the 1980 International Jean Sibelius Violin Competition in Helsinki and the Gold Medal at the 1982 Tchaikovsky Competition. In 1983 she daringly defected to the West during a concert tour, leaving a Soviet-owned Stradivarius behind on a hotel bed. A survey of recordings from Hilary Hahn to Nathan Milstein shows a diverse range of approaches to solo Bach. Listening to this recording, it’s hard to imagine a more compelling interpretation.